Chromecast supported video container formats are MP4 and WebM - DVD is not supported by Chromecast. You can't directly stream DVD movies to Chromecast unless you convert the physical DVD disc to Chromecast supported media type. Below we will walk you through how to rip DVD to Chromecast 1/2/Audio/Ultra and stream DVD to TV smoothly from computer (Mac/Win/Linux) using Chromecast. The very first step is to download a robust DVDs to Chromecast converter that helps transcode DVD disc to Chromecast 1st generation/2/Audio/Ultra accepted media format. MacX DVD Ripper Pro, a leading Chromecast DVD converter, is right for the job. It can convert DVDs to Chromecast with Chromecast supported video format H.264 MP4 at blazing fast speed thanks to HT engine and QSV. DVD encryption won't be a barrier for the cutting-edge DVD to Chromecast ripper, as it is able to bypass nearly any DVD copy protection schemes due to frequent updates and unique tech, be it Disney DRM, RCE, Sony ArccOS, Region Code, or special schemes applied to workout/AV etc. DVDs. Plus, original quality can be remained with the help of embedded High Quality Engine. It's quite easy to rip DVD to Chromecast friendly format, just download the DVD converter for Mac or for Windows and launch it. Insert DVD to disc drive on your computer and following the steps below. Step 1: Click "DVD Disc" icon on the main interface to load DVD disc. The best DVD ripper software will load the DVD immediately and give options to choose output profile. Step 2: Select an output format on the popping up Output Profile window. "MP4" is an ideal format for Chromecast. Considering that Chromecast only accepts H.264 MP4 video, you are suggested to convert DVD to MP4 for Chromecast as well as streaming DVD to Roku. If you have no idea what format to choose, check out Chromecast supported video audio codecs. Audio codecs: HE-AAC, LC-AAC, MP3, Vorbis, WAV (LPCM), FLAC. Step 3: Click "Browse" button to save the converted DVD file for later streaming to Chromecast 1/2/Audio or Chromecast Ultra. Step 4: Click "RUN" and start to process DVD movie titles to Chromecast conversion. The whole process will be finished soon, and then go to the final step - start to stream DVD to Chromecast from computer. The tool can convert DVD to AVI, MOV, WMV, MKV and a wide range of other formats, with tons of preset profiles for iPhone 7/SE/6s/6, iPad, Samsung S7/S6, Apple TV, the list goes on. Note: Please convert commercial DVDs to Chromecast for "Fair Use". To stream video to Chromecast, you need an app. There are many apps that can help cast video to Chromecast, however, some are not free, some cause video and audio lag or choppy. But you won't go wrong Videostream for Google Chromecast, the most popular program to play local DVD videos on Chromecast or Android TV from PC/Mac/Linux smoothly. Detailed guide to cast DVD disc to Chromecast is shared below. Step 1: Go to videostream for google page and click "+ADD TO CHROME" at the top right corner to install the Google Cast extension on your computer. Step 2: Copy the converted DVD video address to the to the address bar instead of a web address, for example, "file///C:/movies.mp4". For Windows users, you can directly drop video to Chrome browser and the DVD video will start to play on Chrome. Step 3: Enable to cast DVD to Chromecast. 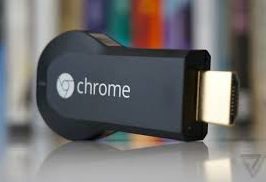 Click the Google cast extension on Chrome tool bar and select Chromecast device, and the DVD video will be streamed to TV with HDMI port from computer using Chromecast. Note that your computer, TV should be connected to the same Wifi. Stream DVD to Chromcast or to Roku or to Apple TV? We have detailed comparison of Apple TV vs Roku vs Chromecast. Google Chromecast and Roku stick are cheaper than Apple TV, and both of them support a wide range of TVs. When you watch DVD on Chromecast, you rely on your Android iOS mobile devices or computer to control, while Roku Streaming Stick lets users directly rely on directional pad to pause, play, rewind or fast forward DVD video. Among these three media streamers, Apple TV is the most expensive one, but also coming with the best flexibility. Apple TV can be connected to any network and its Remote app on iOS enables you to control over your network using iPhone or iPad. But you should know that Apple TV and Chromecast are different things, the latter is only an add-on to existing computers or mobile devices, while Apple TV is a device with tons of built-in apps. If you have Android devices, stream DVD collections to Chromecast, and you'll prefer to rip DVD to Apple TV and stream DVD on Apple TV if you have many other Apple devices. What Apple TV advantages induce users to buy new Apple TV? This article tells what's new for the 4th Apple TV and the specific advantages of Apple TV compared with Roku, Chromecast. 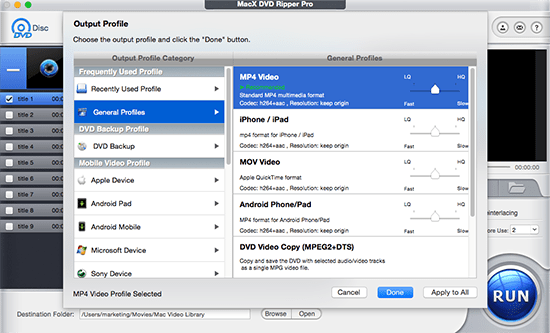 MacX DVD Ripper Pro is the best DVD to NAS converter which can freely remove any DVD protection and rip/convert DVD to MP4, MOV, AVI, WMV, MKV, MTS, MP3, etc. video formats and portable devices (iPhone iPad Android) with original quality.